DigThisArt by Paula Radl: Happy New Year 2012!! I hope everyone enjoyed their holiday season visiting with family and friends. At this time of year I have a little more down time to work on my art and various projects I didn't have time for in the busy months of the year when I am doing gardening. I have my own gardening business where I provide the service of being your own personal gardener and taking care of the plants and flowers throughout the spring, summer and fall. This keeps me very busy but I truly enjoy seeing the benefits of my labor when a customers garden/landscaping is providing so much beauty. I will try to add more pictures of my art and thrifty garden ideas as I make them, so stay tuned for more fun and inspiration. 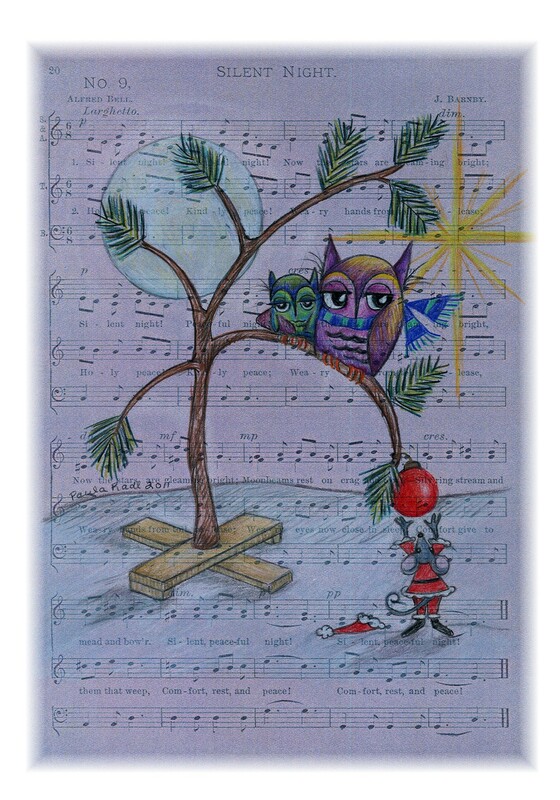 This piece I had made for my 2011 Christmas card. I used a piece of vintage sheet music and scanned it, then printed it in this purplish shade to look like night time. I then drew the picture and colored it with Prismacolor colored pencils. I call this piece "Silent Night" as the words of the Christmas song from the sheet music are visible through the drawing.